7 1/4" H x 3" Diameter at widest point, near the middle. Colors: Navy Blue with stamped on NWCA Emblem on front side. 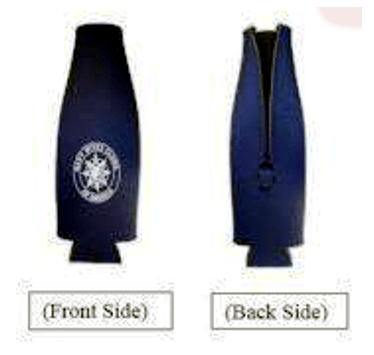 Nylon, rubber, padded, Koozie holds a standard size 12 oz. glass bottle or a standard size 12 oz. aluminum can. Back Side, 4 1/2" zipper with ring, allows Koozie to open up for loading and unloading your containers.